As newly-elected President Park Geun-hye prepares to visit Washington, DC to meet with President Obama on Tuesday, South Koreans continue to express overwhelmingly positive views of the United States and its president. The two leaders are expected to discuss a strategy to deal with recent North Korean provocations, including a third nuclear test, the sentencing of an American to 15 years of hard labor and the closing of an industrial park run jointly with South Korea. Park, who was elected in December as the first female president of South Korea, will also address a joint session of Congress on Wednesday, to discuss the U.S.-South Korean relationship at a time when tensions are rising in the region. 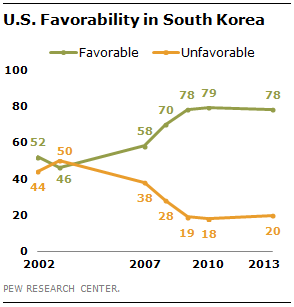 A new Pew Research Center survey finds roughly eight-in-ten South Koreans (78%) have a favorable opinion of the U.S. While this figure is basically unchanged since Obama first took office in 2009, it is a significant improvement from the early years of the George W. Bush era. In the months following the invasion of Iraq in 2003, positive views towards America dropped to 46%. However, before Bush left office in 2008, they had climbed back to 70%, and have remained high ever since. President Obama himself also enjoys high ratings from South Koreans. In the most recent survey, 77% express confidence in the American president’s ability to handle world affairs, with only 20% saying they lack confidence in him. Similar percentages voiced positive evaluations of Obama in the years after his initial election. Assessments of former President Bush were much harsher. 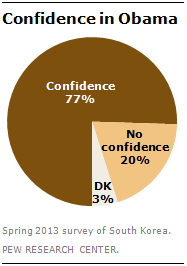 When he left office in 2008, only three-in-ten South Koreans had confidence in Bush, while 64% had little or no confidence.